The screen tech experts at DisplayMate are back again with a new study. This time around they're comparing 3 IPS screens, and it looks like there's more to the display than just the type of screen tech it's based on. The Kindle Fire, iPad 2, and Nook Tablet are all IPS screens, and the screens on the KF and NT might even have come out of the same factory. That means they're based on the same In-Plane Switching technology. The specifics of the screen tech aren't important here, but what is important is that the Nook Tablet lives up to the boasts made by Barnes & Noble when it was launched. DisplayMate tested the screens for Screen Reflections, Brightness and Contrast, Colors and Intensities, Viewing Angles, Display Backlight Power Consumption. There's a 6th category, Running Time on Battery, but DisplayMate hasn't recorded any figures for the battery life of the Kindle Fire or Nook tablet. There was no single winner of every category, but the Kindle Fire did consistently come in second or third place in most categories. And more often than not, the Nook Tablet came in first place. 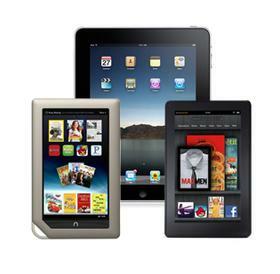 The iPad 2 and Nook Tablet didn't get raked over the coals nearly as much as the Kindle Fire. In fact, aside from the technical differences in the screens, there was hardly a bad word about the 2 tablets. The Kindle Fire, on the other hand, was faulted for software issues and for having a highly reflective screen. The display on the KF was so bright that it reflected significantly more light than the iPad 2, and over twice as much light as the Nook Tablet. The KF is a new device, so it probably comes as no surprise that there are problems with the software. DisplayMate noted that the KF is using 16 color in the Gallery, not the 24 bit color seen elsewhere on the KF and on other tablets. The Gallery also showed serious issues with grayscale images. Now, the software issues could be fixed, but there's not much anyone can do about the highly reflective screen. Well, you could use it as a mirror so you could brush your teeth, but there's no practical way to reduce the glare. DisplayMate cautioned against using a screen cover to reduce the glare; they say that it fuzzes out the glare with a matte finish. P.S. When I approach this from a technical point of view, the data is fascinating. I love highly detailed and intricate reports on which is better. But from the user view point, I'm not sure it matters. I've had both tablets on my desk, and I couldn't really say that one was better. They were both such a significant improvement on standard LCD screens that I've seen on ereaders and tablets that the differences were imperceptible - to me, at least. What did you think of the screens? My iPad Now Has a Kindle Email Address & Backs up My Notes! No matter because Barnes and Noble can’t compete with Amazon long-term. I give them five years. B&N *wishes* they had five years. If they last that long they’ve survived the transition to digital just fine. Their challenge is making it through the next 18 months without having to resort to Chapter 11 to triage their B&M storefronts. I should have said five years tops. I expect they will find a suitor unlike Borders. Best they got was a mortgage of sorts. Without the Liberty Media loan they would probably already be in Chapter 11. You and I must be looking at different information. BN’s actually narrowing it’s losses because NOOK is so big. 1- B&N has 29% of the US market. Not likely to get much bigger as Apple starts to get some traction. 2- US ebook reader adoption is likely going to plateau fairly soon, probably in the next 18 months. Hence the current efforts of Amazon, Apple, and Kobo to *expand* their presence outside the US. 3- B&N is about to *start* to expand internationally. Into the UK. About a year late. 4- B&N seems to have no end of “refurbished” Nok Colors and STRs and still has original Nooks for sale as “new”. Recent pricing and promotion moves suggest they have *more* than they’d like. Note that I’m not saying B&N is *going* to tank. I’m just saying that it’s far from impossible. First they need to survive the next year or so. They are playing a high stakes game with a minimal bankroll and little margin for error. They talk a good game but some of their actions suggest the light at the end of the tunnel might just be a train. All depends on the needs I think. Personally I prefer the Kindle Fire. And guys might be interested in reading this “Kindle Fire VS Nook Tablet-Specs comparison” what listed as a chart in Aneesoft.